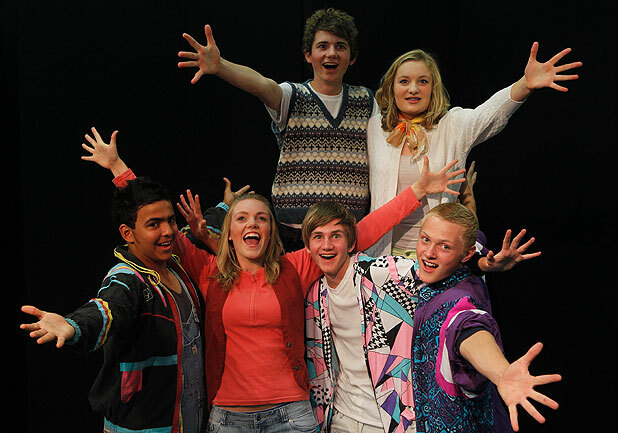 More than 60 students from Nelson College and Nelson College for Girls will borrow their parents' clothes from the 1980s for Fame: the Musical. The production documents a group of students in the 80s at the famous New York School for Performing Arts, trying to make their fame and fortune as stage performers. Fingall Pollock, 29, produced and directed the show. The former Nelson College for Girls student is enthusiastic about the production, which she says the cast has been working hard at perfecting for their opening performance next Wednesday night. Pollock says it's the ideal show to do with high school students. "It's just awesome. I love the theme – wanting to be famous because all of these kids want it – it's the age before you realise how hard it is to be famous. Teenagers can relate to it and really like it. "I just love musicals, I was in every musical when I was at school and I really like directing." The production is being presented by both Nelson College for Girls and Nelson College students with a cast and crew of more than 60 students aged between 13 and 18. The students are organising the whole show – including lighting, sound, costumes, makeup, choreography and music. Practice has been full-on. They started off rehearsing twice a week and now get together five times a week, after school and at weekends. The production is highly energetic, including four styles of dance: ballet, hop-hop, American jazz and salsa. It's the first time Pollock has worked with high school students, and she has been blown away by their talent and experience within theatre. "It's really good – it's almost like working with professionals because the calibre is so high, they can just take direction – they are almost like trained actors with good experience – and years of it." Pollock left Nelson when she was 18 to study theatre, and has since been travelling and working overseas. For the past 3 ½ years she has been living in Berlin, acting and directing. In Berlin she works for a company called Platypus, which is an educational theatre. Its plays include English and it is funded by the government. "That's my bread and butter in Berlin." During her time in Berlin she also directed two New Zealand plays – Blue Vein and Love Puke – both written by New Zealand playwright Duncan Sarkies. She met her German fiance overseas and has returned home following a desire to show him New Zealand. Before she returned home she asked her mother – a teacher at Nelson College for Girls – if the schools were doing any productions. She then applied to the school, setting out her proposal for Fame which was accepted. "It's worked out really well." Fame, June 8 to 11, Nelson College for Girls Hall. Ticket prices for flat seating are $20 for adults and $12 for students. Tiered seating costs $25 for adults and $15 for students. A family pass is $65 for two adults and two children. Tickets can be purchased through the colleges or Everyman.